Let’s go ahead and get the unpleasant, and obvious, out of the way: this is not the most pleasant of topics. 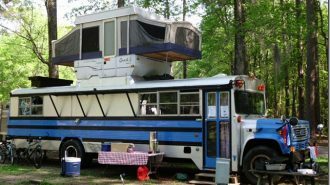 We’re going to have to talk about some unpleasant realities of life while utilizing your RV. 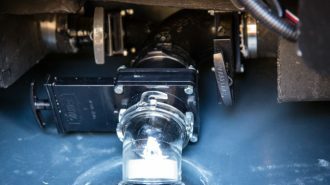 We’re talking about holding and removing human waste from an RV, and while RV waste holding tanks aren’t the most glamorous topic that we get to cover when talking about our RV’s, it certainly is an important one. 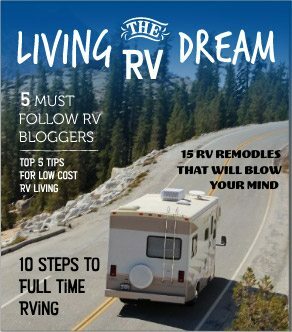 As an RVer, there are two ways you can deal with your RV black tank. 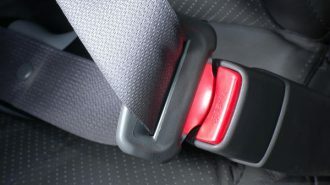 First, you can ignore it, and never use it. 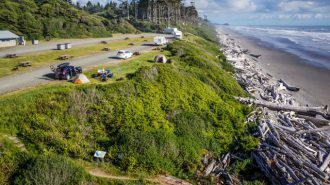 It’s not uncommon for RV owners to only camp in places where they have access to public bathroom facilities, so that they don’t have to use their RV toilet. These people don’t want to deal with the unpleasantness of emptying the tank, so they just don’t use it. I, in fact, grew up around some of these people. 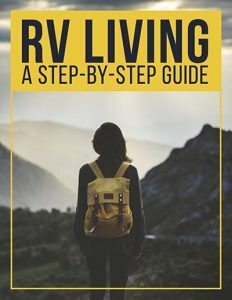 Second, you can learn how your toilet and RV black tank works, enjoy the option of having your own private bathroom facilities right in your RV, and deal with the reality of having to empty and clean that tank. 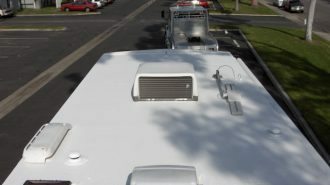 An RV has two types of waste tanks on board: a gray water tank, and a black water tank. A gray water tank collects the water that goes down the drain of your RV shower and sinks. It is the presence of soap residue and dirt that give this waste its name and gray-ish look. However, we will not be discussing RV gray water tanks in this piece. 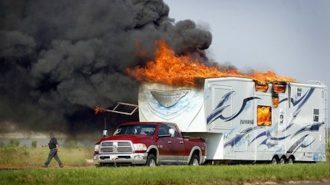 A black water tank collects waste from your RV toilet only. It’s called a black water tank… well, let’s just say, it’s called that for obvious reasons. 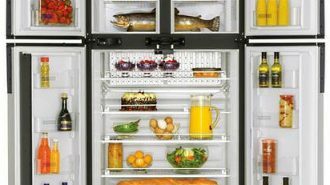 The black water tank (or RV waste tank) collects both liquids and solids, so caring for it is a bit different than your gray tank. In addition to human waste, the RV black tank also collects water used to flush the toilet, and of course, toilet paper. 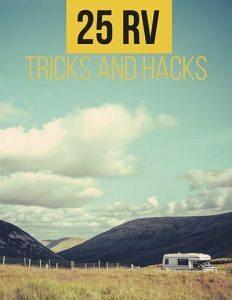 If you want to keep your RV black water tank working properly, and (relatively-speaking) clean, it’s important to know that your RV septic tank should always start with some water in it as a base. Why? Well, think of your toilet at home. 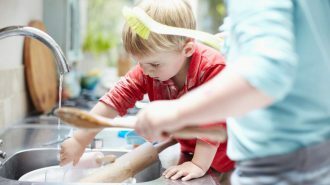 There is water in the bowl before you “do your business” for two reasons: First, it keeps odors from permeating your living space, and second, having water in the bowl first, helps make sure any solids that enter the bowl can move along without sticking. 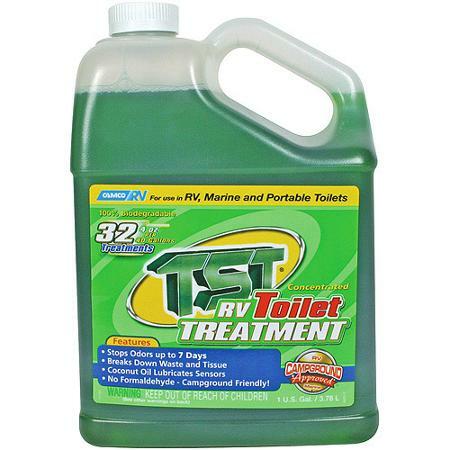 Now that you have a base of water in your RV black water tank, it’s important to add a holding tank chemical to it, by dumping some down the toilet. You can purchase holding tank chemicals in liquid form, like the Camco TST Holding Tank Liquid Treatment. You can also purchase in packet form, like the Walex Bio-Pak, available in a variety of styles and scents. A holding tank chemical is an environmentally-safe liquid, that is added to the RV black water tank, to help break down waste and tissue, as well as to help control odors that build up in the tank. 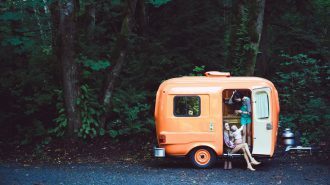 The chemical that you choose will have instructions on how much you should add, but if you are a weekend warrior in your RV, generally a couple of ounces is sufficient to get you through the weekend. 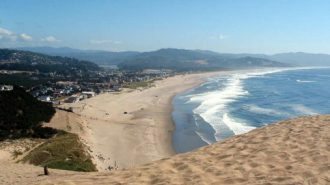 Now that you’ve made it through the weekend, you’ll want to find an approved place to dump your waste tanks. 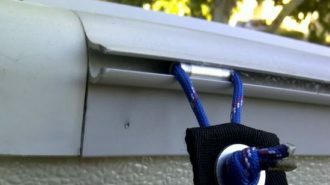 You will then hook the waste hose to your RV (according to your manufacturer’s specs), and secure the other end to the dump station. 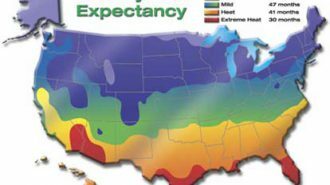 You are going to be emptying both your gray and black water tanks, but it is important to remember to ALWAYS empty your black water tank first. Once it is done emptying, close the valve for the RV black water tank, then open the valve to empty the RV gray water tank. The reason you empty the black water tank first is so that the relatively “cleaner” water, coming from the gray water tank, can flush out any waste left in the hose (from emptying the black water tank). In addition to emptying your tank after use, from time to time you’ll want to do a more thorough cleaning of your RV black water tank. Waste and tissue can build up in the tank, causing potential clogs, and playing games with the sensors that indicate how full your tank is. 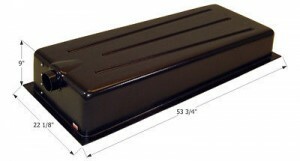 To flush out your RV black water tank, there are a couple of options. 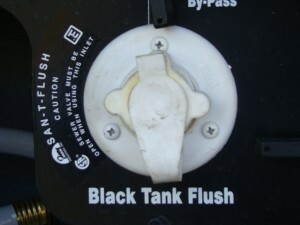 Many RVs come equipped with an RV black tank flush valve. In this case, you simply hook a hose to the rinse valve, and run water into the tank to flush it out. If you have this kind of flush valve on your RV, flushing your black water tank is fairly easy. 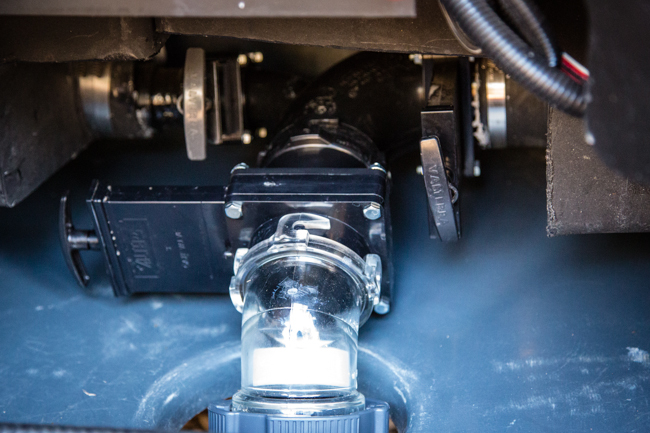 If your RV does not come equipped with a manufacturer’s tank flush, you do have the option of adding an after-market flush valve to your RV black water tank. 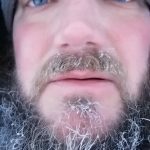 This type of after-market option comes in many shapes and sizes, and typically requires drilling a hole in your RV black water tank. 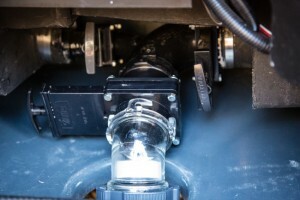 Lastly, if you don’t have a manufacturer’s tank flush valve, and you don’t wish to add one to your tank yourself, you will need to employ a more manual method of RV black water tank cleaning. 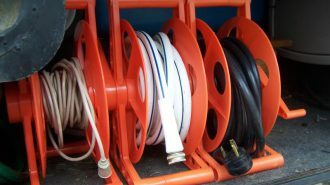 One of the more popular options, for an RV black tank cleaner, is to utilize a garden hose extension called an RV holding tank rinser. Camco makes a great model called the “Swivel Stik” that many RV owners swear by. 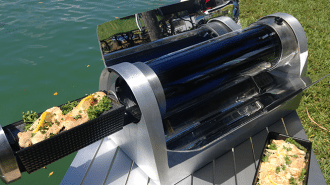 This rinser is designed to spray water in multiple directions, in order to clean debris and tissue from the sides of your RV black water tank. 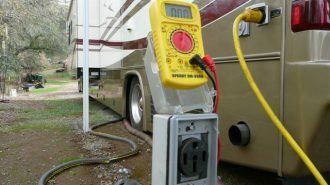 To use the holding tank rinser, you will first want to make sure that your RV is not hooked up to a city water connection, and that your RV water pump is shut off. 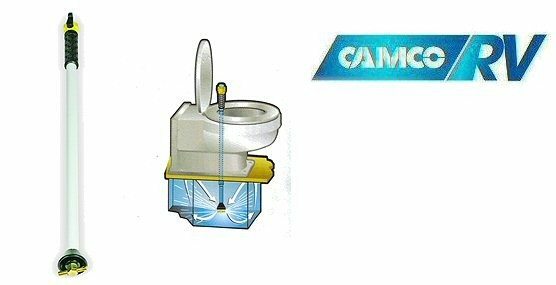 Next, open up the flush valve to your RV toilet, and insert the holding tank rinser into the toilet, so that it goes down into the black water tank. When you turn the water on, the rinser will send water in multiple directions, but you’ll also want to turn and twist the rinser, to make sure you get as much of the sides cleaned, as possible. Once this is done, you can empty your tank as normal, and any debris that was removed from the sides of the tank will be emptied into the dump station. 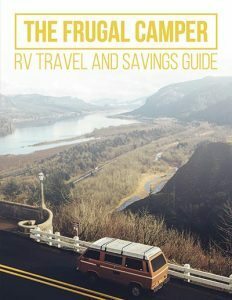 If you camp in the same spot for long periods of time without sewer hook ups, you may find it necessary to take advantage of a portable RV waste tank. These waste tanks allow you to empty the contents of your black and grey water tanks into an external tank, which you can then transport to a dump station. RV portable waste tanks usually have wheels and a handle, so they can easily be pulled across the campground for dumping. 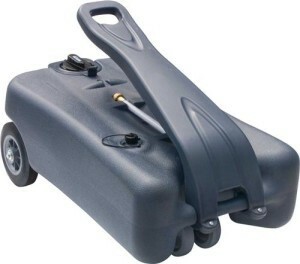 It is important to realize that if you use a portable RV waste tank, you should take the same care to clean and flush it, as you do with the on-board RV black water tank. 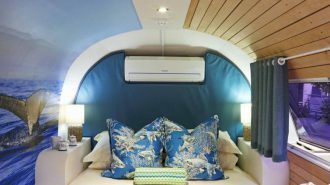 Dealing with your RV black water tank is definitely one of the more unpleasant areas of using an RV, but the comfort and privacy that having an RV toilet on board affords you and your family is one of the biggest advantages to having an RV. 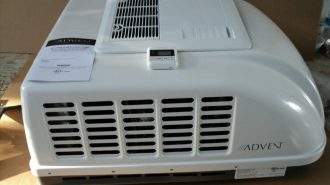 Understanding your RV black water tank, and how to clean it, will give you years of comfort and odorless enjoyment.